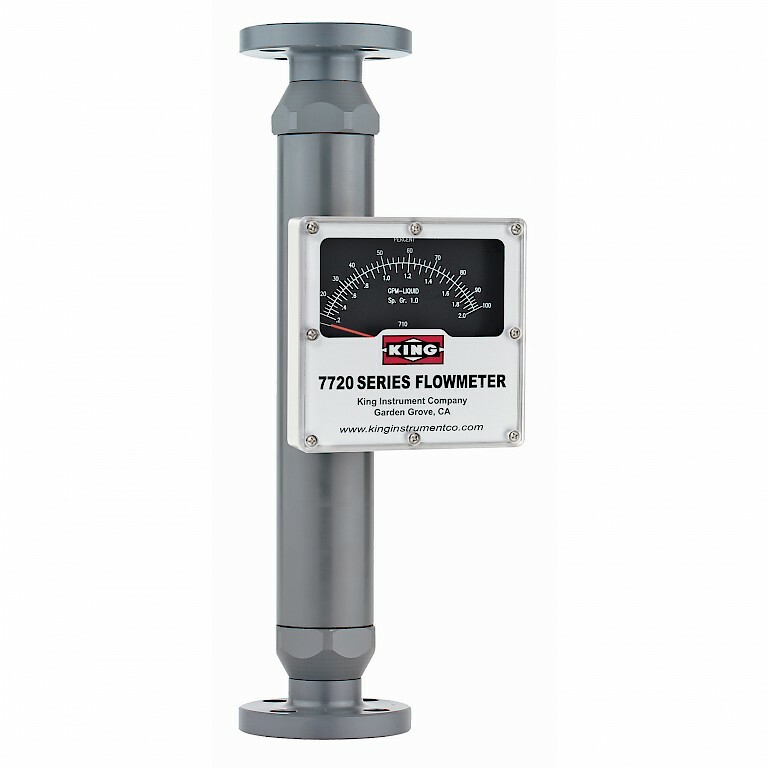 The King 7720 series variable area flow meter offers excellent chemical resistance due to its type 1, grade 1 PVC metering tube and fitting material. Fittings are available with NPT connections or direct flange mount for vertical connections. NPT connections are available from ½” to 2” with 3” and 4” meters being offered with flanged connections. Internal components are C-276 Hastelloy®. O-Rings are available in EPR, Buna-N, Viton® or Kalrez®. The 7720 series has a 120mm detachable direct rading scale. All models have a 10:1 turndown with repeatability at 1% and accuracy of ± 3% of full scale flow. Maximum temperatures are available up to 54°C with maximum operating pressures available up to 10 bar. Liquid models are available with full scale flows from 2 litres per minute to 1700 LPM, with scales available in any volumetric unit. Single or dual inductive slot sensor (NAMUR) alarm outputs are also available. A 4 – 20 mA flow transmitter option is available as well.